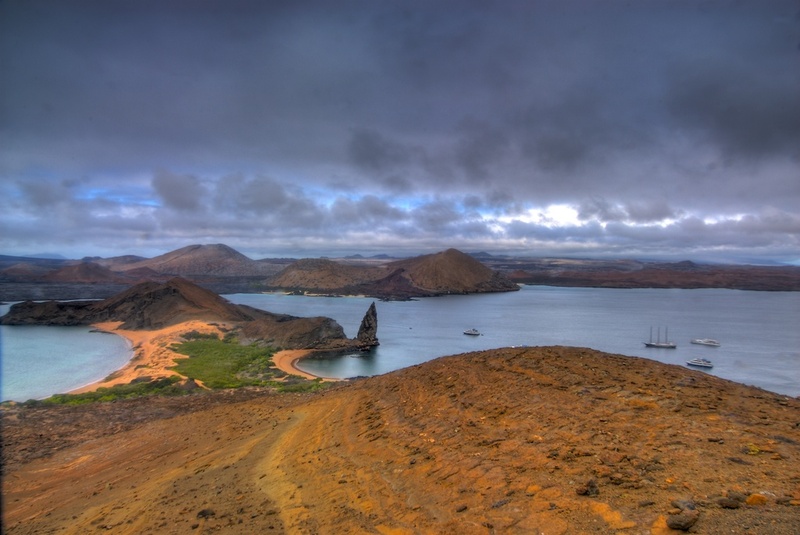 Magical is the most overused word when writing about the Galapagos, those magical islands off the coast of Ecuador. Oops! Sorry, but there really is something about these islands that gets under your skin. One visit and you’re hooked. Two visits morphs you into a passionate advocate. On my last visit I tried to figure out just what is so alluring about the Galapagos. Compared to the lush majesty of the Hawaiian Islands they rank a distant second. They can’t boast four-diamond restaurants or five-star hotels and there is not a shopping mega-mall or multiplex anywhere. What does make them so special is that they are situated directly on the Pacific equator. Deep-ocean currents well up all around them, bringing tons of nutrients to support plankton, fish, sea lions, humpback whales, sea birds, and iguanas. 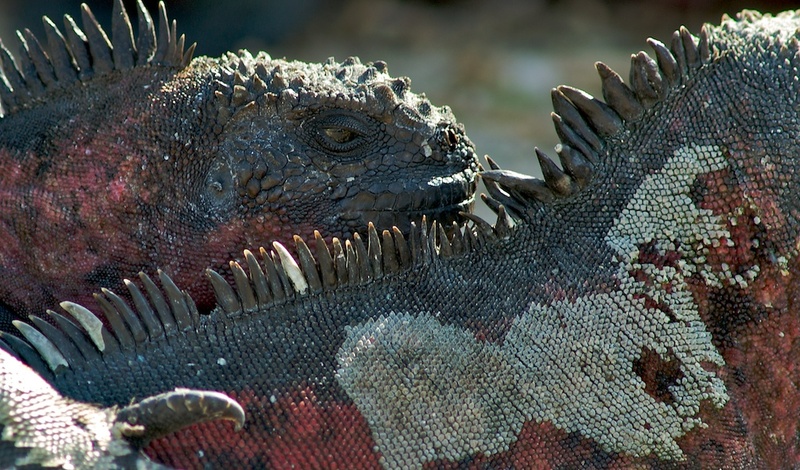 Unfortunately, the very wildlife that makes the Galapagos so attractive may be its undoing. Today more than 148,000 visitors flock to the islands, an increase of more than 87,000 since 2000 alone. This influx of tourists has been responsible for a corresponding spike in residents, both legal and illegal, that cater to the tourist trade. The environmental stresses associated with that level of human activity – think housing, roads, pollution - has brought this fragile ecosystem to imminent crisis, with UNESCO recently adding the archipelago to its danger list. When locally owned and run boats handled all tourism, there were fewer problems. But the advent of mega-ships, each unloading hundreds of tourists at a time has exacerbated the environmental damage. A side effect of the overpopulation is that marine stocks are being over-fished, prompting restrictive government regulations. In February, 2008, 53 sea lions were slaughtered, most likely by local fishermen upset with those new measures. Concerns over the fate of the Galapagos have prompted the tourism industry to band together with Galapagos National Park administrators and scientists to develop sustainable eco-tourism standards. It is now possible to be an eco-conscious Galapagos tourist. First, and most importantly, choose a locally owned and operated smaller boat, one that holds 10-30 tourists, with 20 being the ideal number. They have far less impact on the environment and can place you on island locations that the larger ships simply cannot access. Probably the oldest company serving the Galapagos is the venerable Metropolitan Touring (www.metropolitan-touring.com). Metropolitan operates a huge recycling center that converts all of its plastic waste to pavers that are used in street construction in Puerto Aroyo, the main port of the Galapagos. They also recycle paper and donate money for environmental conservation through their private foundation. The most eco-conscious tour company is locally-owned-and-operated Ecoventura (www.ecoventura.com), operating a fleet of three boats that each accommodates 20 people. The accommodations are rustic and the food good and plentiful, not gourmet, but the guides are terrific and you will always be in an excursion group of no more than ten, which in itself minimizes the effect on wildlife. Ecoventura has been cited repeatedly for its forward-thinking environmental agenda that includes a ten-point program to reduce its environmental impact. In fact, Ecoventura recently entered into a partnership with the World Wildlife Fund that places it on the forefront of environmental stewardship. These ecological concerns, coupled with more stringent protective regulations, make it incumbent on the tourist to be sure they get what they expect during their visit. For example, as of 2008 the number of tour boats has been capped at 85. But, certain islands or sites are available ONLY to boats carrying 20 or fewer passengers. In addition, there are regulations pending that may limit each tour boat to a prescribed two-week rotation, so that environmental impact can be closely monitored. The best advice is to read up on the Galapagos and make a wildlife wish list, then correspond with your operator to be sure you will see those animals before putting down a deposit. But act fast, because with the number of boats capped so are the number of visitors and reservations are often made a year or more in advance. Since the Galapagos archipelago is a living laboratory, regulations change, although usually with some warning. For example, Fernandina Island is currently off limits to snorkeling due to the stresses placed on sea turtles and other wildlife. Parts of Isabella Island are off limits until the introduced goat problem is solved and endemic plants recover. That might be several years. As a result, some are requiring tourists to sign what could only be considered onerous release forms. The insane thing is that these are not mailed in advance. The first you will see of it is when you land in the Galapagos, just minutes before boarding your boat. I have seen some pretty irate tourists facing a draconian choice of signing or going home. My recommendation is that you demand to see any releases before putting down your deposit. Once you visit the Galapagos, you will understand why I say that any hassles you might have getting there fade quickly into background noise. You’ll carry the pungent smell of sea lions in your memory bank for a lifetime. Ditto the sights of a baby albatross spreading its wings, or hundreds of marine iguanas basking in the sun, or the sounds and sites of thousands of frigate birds nesting. Oh, did I say that these islands are just magical? The Galapagos archipelago consist of 19 islands, directly on the equator, some 650 miles off the coast of Ecuador, covering an area of nearly 20,000 square miles of ocean. Ecuador uses the American dollar as its currency, making it an easy travel country for Americans. And, speaking of currency (well, sort of), Ecuador uses standard 110 volt current, the same as the U.S.A.
Be sure every question you have about your itinerary and ship is answered before you pay your deposit. Know which wildlife you want to see and which islands you want to visit and be certain that your tour operator will accommodate those wish lists on your specified dates. Be aware that every plane is sprayed with 2% D-Phenothin (an insecticide) before landing in the Galapagos. 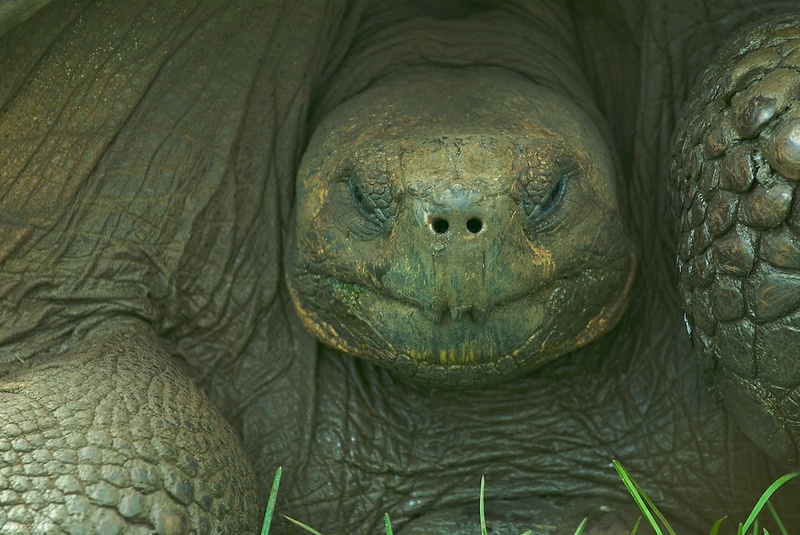 That’s good for the Galapagos wildlife, not so good for you. Bring along a bandana, disposable breathing mask or breathing filter to wear when spraying begins. Guides are licensed by the Galapagos National Park in a rigorous process. They are experts in every sense of the word and usually good with people. However, remember that their first priority is to protect the fragile ecology of the islands. Therefore always stay with your group, follow directions carefully and do not wander off prescribed paths. Be forewarned that paths are often slippery, very rocky and are often studded with razor-sharp lava. 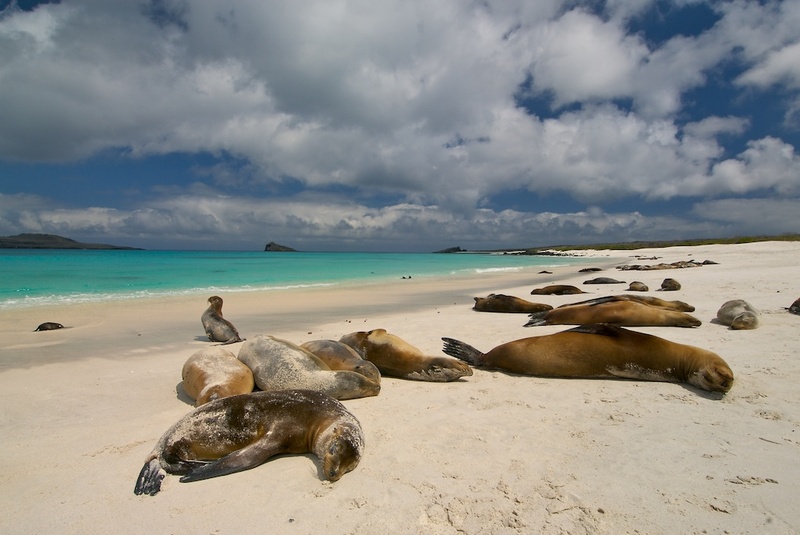 You will never get closer to exotic wildlife than you will in the Galapagos. However, you are not allowed to touch any of the wildlife there. By abiding by these regulations you will reduce stress and the transmission of disease to wildlife. Delicate as it is to mention, one of the biggest problems reported by Galapagos guides are bratty children whose parents cannot bear to tell them “no.” I have seen unruly children chasing nesting albatrosses and kicking defenseless marine iguanas. Look at your impending Galapagos excursion as an unprecedented opportunity to learn to set limits for your children. If your kids are already perfect, please accept my apologies. Most Galapagos tour companies will arrange side trips to the Amazon and to the Otavalo highlands region. Take advantage of these once-in-a-lifetime experiences. I would recommend Sacha Lodge in the Amazon (www.sachalodge.com). For an over-the-top, upscale, and moderately priced experience in the indigenous Otavalo region, attractive to shoppers as well as hikers, try the five-star La Mirage Garden Hotel & Spa, which is a Relais & Chateaux property in Cotacachi-Imbabura (www.mirage.com.ec) . Bring a good camera and at least twice as many memory cards as you think you will use. Take advantage of snorkeling opportunities, even if you are a timid swimmer. Sea lions dart around you, sea turtles glide effortlessly below you, and marine iguanas will swim right by you en route to their seaweed grazing beds down deep. And that’s in addition to schools of colorful fish and corals. Magical, really!